The information regarding Thomas’ grave was told to me by Roger Edmondson, a cousin who lives in Tazewell, TN. Several years ago, he took me to the gravesite and told me the story that had been handed down to him by his father and grandfather. Everything that I had previously read had indicated that Thomas’ grave is at the bottom of Norris Lake. As Roger relates, even when the lake is at full pool, at least half of the cemetery is out of the water. I suggested that Roger write the information down so it can be passed on to all who are interested. He summarized it in an article entitled “Big Barren Primitive Baptist Church & Cemetery”. 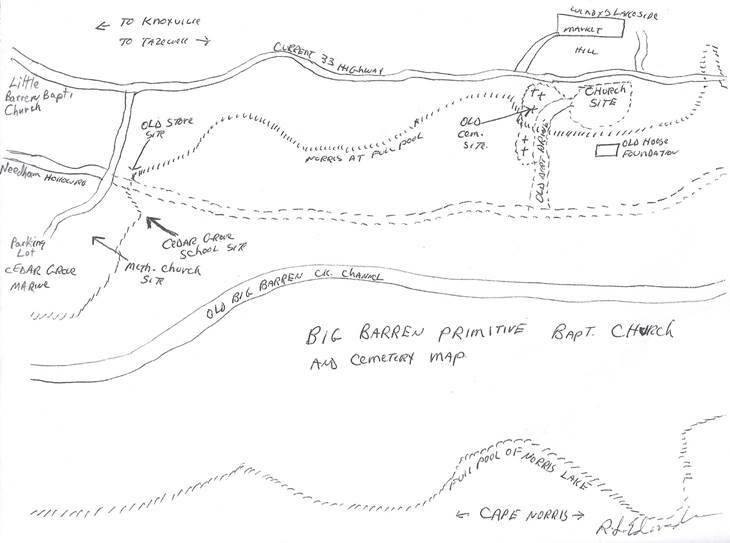 Roger also gave me a map that he had drawn that shows the location of the church and cemetery. My great grandmother was Catherine Goin Edmondson, wife of William Lane Edmondson, daughter of Sterling Goin, granddaughter of Old Levi Goin, and great granddaughter of Thomas Goin. One of her sons, Robert Dewey Edmondson, was my grandfather and lived next door to her and her husband. She was one of three Goin sisters that married three Edmondson brothers. 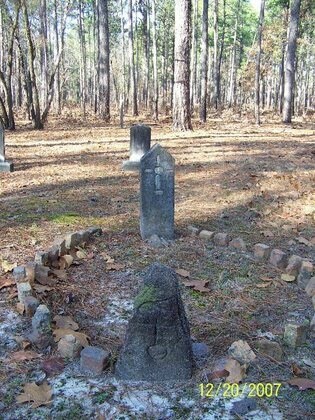 Catherine and her sister, Mary, are buried at Cox Cemetery, Claiborne County, Tennessee. Therefore my line of Edmondsons are very familiar with the Goin legacy, in Claiborne County, and the confusion over the location of the old church and cemetery and especially Thomas and Levi’s, and their wives, graves. The church and cemetery was located less than one third of a mile from the farm that Catherine and William owned at the time of the T.V.A. grave removal. My brother and I own the farm now. The old log and plank church stood overlooking Big Barren Creek in Claiborne County, Tennessee. 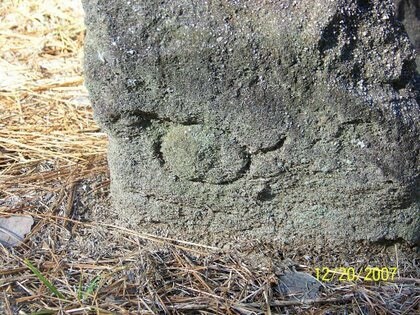 It was located on the right side of the old Knoxville highway (33) heading south toward Knoxville. There was a short dirt drive going up hill from the right side of the highway. The drive curved to the right before turning into the church. Located to the left of the bend was the cemetery. An old house foundation sits about 150’ below the church and is under water when the lake is at full pool, but the church site is not. The cemetery extended from near the top of the first hill, over to the drive, and then down the south side of the drive almost to the old highway. At full pool at least half of the cemetery is out of the water. The entire site is located just south of the current Knoxville Highway and across the road from Windy’s Lakeside Market. It lies about three miles north of the Union/Claiborne County line and about nine miles south of New Tazewell, Tennessee. Cedar Grove Marina is located about one third mile downstream from the church site. The church that was located very near to the marina was Cedar Grove Methodists Church; there was also Mr. Western’s store and Cedar Grove Grade School. My father and grandfather both attended the grade school. Their graves, as were many graves of that time, were only marked with slabs of limestone ledge material. 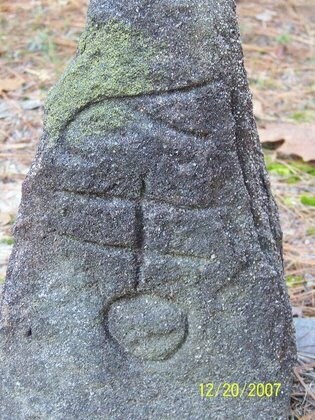 Most of the stones were unmarked and regular gravestones were rare. The graves were in the uppermost section of the cemetery and were not removed during the T.V.A. 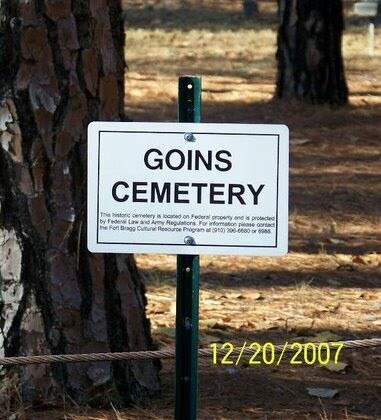 Grave Relocation Project. My grandfather and his extended family used to camp on the old church site. I camped with them during the 50’s and 60’s. We used some of the old church foundation rock as a hearth for cooking and just sitting around at night. In the overgrown cemetery shallow, mostly filled in rectangular pits were plainly visible, the number being around a dozen. My grandfather and his brothers used to tell us children ghost stories about the cemetery and we stayed scared to death for most of the nights that we camped. Note: Some of the bodies were relocated to Cox cemetery in Claiborne County and to Big Barren Memorial Cemetery on Little Valley Road in Union County, Tennessee. Many times my grandfather and father told me about their small part in the T.V.A. Grave Removal Project. They told me that the T.V.A. notified the people of the area, I suppose by posted bills and the newspaper, of the date and time they would be working in a particular cemetery. 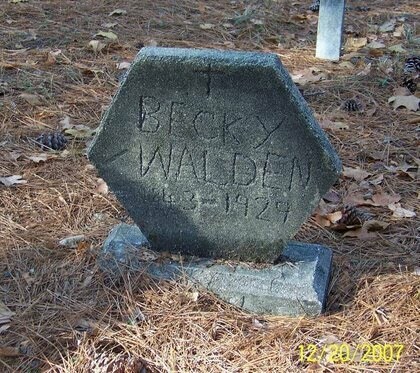 In 1934 or 1935 my great grandmother, Catherine Goin Edmondson (age about 68), my grandfather, Robert Dewey Edmondson (age about 35), and my father, Earnest Edmondson (age about 13) walked the short distance from the back of the farm down to the cemetery. There they met with a T.V.A. official. They told them that they did not want the graves of Thomas, his wife, Levi and his wife removed. As they were the only people there to speak for the Goin family their wish was granted and the graves WERE NOT REMOVED! The T.V.A. even offered to put up new stones for them in another cemetery, but they refused the offer. Many Goin researchers have their own ideas about the church, the cemetery, and the graves, one man even calling my ancestors liars, however my family was there and took part in the decision making. My great grandfather even attended the church a couple of times. The cemetery and church site are now seriously overgrown to the point of being impassible. If I could gain access to the cemetery through the thick underbrush I’m sure I could stand within a fifty-foot radius of where the graves are located. If anyone goes to the site do not expect to see any left over gravestones, as I remember none being left behind when I used to camp there. Even though this is an oral history of the church and cemetery my ancestors had no reason to speak anything but the truth and the empty graves speak for themselves. Eddie Goins, a well-recognized Goin researcher, suggested that I write this down before the information is lost forever. On October 10, 2009 there was a ceremony at Pleasant Point Cemetery, in Claiborne County, TN, to recognize Thomas and two other Revolutionary War soldiers, Harmon Hopper and John Owsley. Three stones were placed in the cemetery to honor these three men. The men are not buried under these stones, but memorialized there. 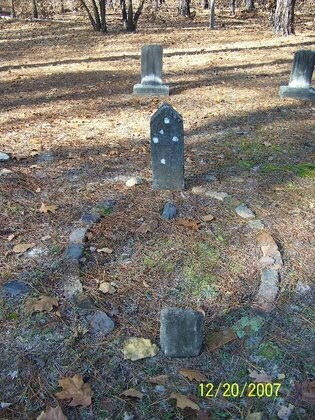 However, I have seen Thomas listed on Find A Grave as being buried in Pleasant Point Cemetery. My cousin, Troy, and I attended that ceremony to see if we might gain some information about Thomas. 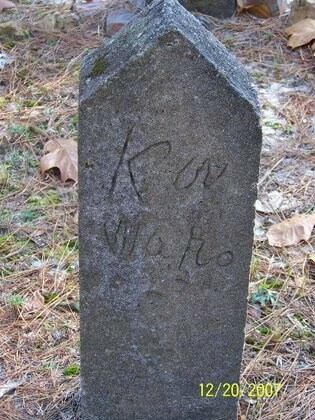 At that time we suspected this Thomas was related to our Thomas Goin(g) of Randolph County, NC, ca. 1729-1797, but we were not sure. On that day we had hoped to gain some insight into his connection with our ancestors. We visited with one of his descendants who was there, but she wasn’t sure if there was a connection. Since then, my Y-DNA and other documents have proven that he was the son of our Thomas Goin(g). Roger had been somewhat involved in planning Thomas’ memorial ceremony. 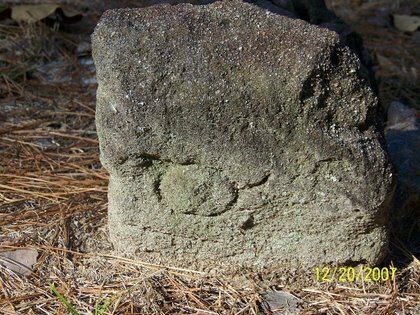 I recently asked him to explain the placement of his memorial stone in Pleasant Point Cemetery. He summarized it an article entitled “Thomas Goin Burial”. 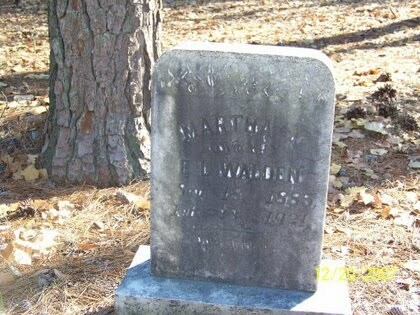 Recently several relatively new researchers have located a gravestone for Thomas Goin at Pleasant Point Cemetery, Claiborne County, Tennessee. However, a local DAR chapter without mentioning that it was only a memorial stone erected this stone. Although several Goin folks are buried there Thomas is not one of them. Thomas was one of the founding members of Big Barren Primitive Baptist Church. This church was located between the Old Knoxville Road and Big Barren Creek. It was a log and plank structure. The church building became untenable for church services and was later used as a barn by John Keck who lived nearby. 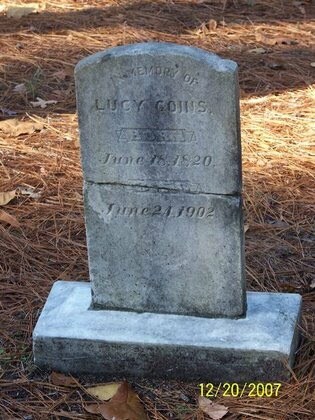 The church records indicate that Thomas, his son Levi and Levi’s wife were buried in that cemetery. In 1935 during the clearing for Norris Lake the Tennessee Valley Authority (TVA) posted a notice in the Claiborne Progress for interested parties to meet at the cemetery at a certain date and time. Catherine Goin Edmondson (Thomas 1, Levi 2, Sterling 3, Catherine 4) her son Dewey and grandson Ernest met with the “TVA MAN” at the appointed date and time. There were no stones marking the graves only slight depressions remained to indicate that the ground had ever been disturbed. 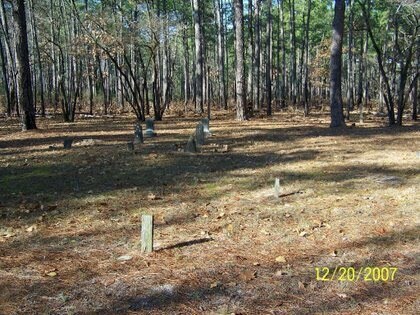 The TVA crews had already relocated many of the marked graves from the newer part of the cemetery located down on the creek bottom. When informed that little could be recovered from the older graves my great grandmother (Catherine) told the TVA MAN to just “leave ‘em be”! The TVA listing for the removals from that cemetery do not list Thomas, Levi or his wife as being removed and reburied. This story was passed down to me by my grandfather, Dewey, and my father, Ernest who stood with Catherine by their ancestors graves on that day in 1935. Thomas’s new stone was placed in an open area of the cemetery over some older unmarked graves. If anyone had the remains exhumed for any reason (DNA, etc.) it would not be his remains under the marker. 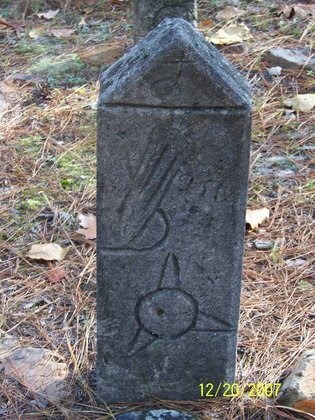 I requested through my SAR chapter president, but to no avail, that a note be added to the back of the stone that it was a memorial stone only and that he was not buried at that location. I dropped out of SAR, who worked closely with DAR on this project, over the lack of frankness about the stone. I wish them the best of luck in future endeavors, however I hope that they are more informative on future memorial gravestones.